Art & Adventure, now out of print, is the only book I've heard Marty Hardison recommend. He began keeping bees about the time the book was published, and I can see that it influences him even today. The Aebis kept bees in Oregon and California, and their book gives very specific details regarding keeping bees there, particularly Santa Cruz. 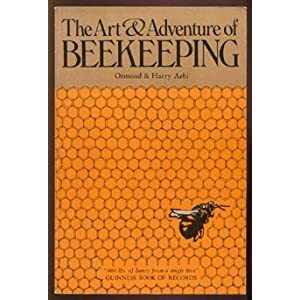 Remember, beekeeping is a localized specialty, so if you're a Santa Cruzan, this book could be particularly useful to you. Surplus honey production isn't our focus, but understanding how to enable the bees to put up ample stores for themselves is a goal every beekeeper should have. Here are some things we had not read or heard before (in bold), followed by my read-between-the-lines interpretation. Put on supers 3-4 weeks in advance of swarming, which begins when the apple trees are in full bloom. The Aebis supered to alleviate thoughts of being crowded or honeybound as a swarm prevention measure, because colonies that swarm don't have the workforce to produce surplus honey, let alone a record amount. In my neighborhood, in a top bar hive, that would mean removing all overwintered honey and providing fresh top bars (i.e. Spring clean) in late March or early April. I would only give them 3-4 top bars to work on, then close up the space with the false back. The reason for "supering" so early is the weather is still cool, and the bees need more time to make and work with wax than they would if it were warm. Second-year beekeepers who can provide drawn comb can add more, say 4-6 bars. As the bees can simply fill the combs, second-year beekeepers have a distinct advantage over beekeepers just getting established, toward putting up honey sooner. When the bees are returning at 115 bees per minute, abdomens extended beyond the length of the wings, it is time to super again. These are nectar-bearers and there is a honey flow on. The weather should be warm enough for the house bees to draw out wax onto foundation (or foundationless frames/top bars), but giving them fully-drawn comb facilitates the making of abundant honey. The Aebis' bees could fill a comb in 24 days if they had to draw it off of fresh foundation, but it took them only 20 days to fill already-drawn comb. They did not present this observation as a suggestion to super every 24/20 days, but rather that beekeepers who can provide drawn comb have an advantage again, toward putting up honey faster. A landing board enables returning foragers, heavy with nectar, to land with ease. A 9" extension gives the fanners extra room to work to move moisture from the hive. Nectar coming in faster, and faster drying mean more honey sooner. Natural hives don't have landing boards, but that doesn't mean we shouldn't provide one on our hives. Remember what I said about "natural beekeeping"? Marty attached a long landing board to the end of this hive, asserting that African bees have no trouble with holes but European bees with full honey stomachs benefit from having a landing board. The Gold Star hive bees use the landing board more than the side holes, for sure. There are many more ideas in the book, all of which facilitate honey-making. It matters not that the Aebis' goal was to break a honey-from-one-hive world record. Their goal led to an understanding about bees that they have shared with us so that we, too, can work with our bees in an efficient, as well as loving, way. It isn't a guide to beekeeping per se. By explaining their practices in response to a variety of situations, they provided us with the ability to work with our bees in ways that support them. In the end, I'm glad my library stinks and I had a to buy a used copy. Since the book is written like a memoirish recall of how they broke the record, there's a fair amount of between-the-lines reading and re-reading, IMO. You'll need to pluck out what's relevant and interpret how the information applies to how you are keeping bees. And if you're Top-Bar beekeeping, even more so. Personally, I'm looking forward to applying some of their ideas in 2012. I'll post a video when the bees are coming back fast-and-furious, and you can help me count if it's 115 bees per minute. How's that sound?